As an Institutes and Centers (ICs) liaison in the Customer Outreach branch of EDI, she is a vital resource to the ICs in regards to concerns related to Equal Employment Opportunities and Diversity and Inclusion. Leading by example, Alfreda makes it her daily mission to help break down barriers of discrimination and enable individuals to recognize differences in the workplace. She undertakes the task of managing effective change by providing timely responses to internal and external customers, in support of both customer and program requirements. 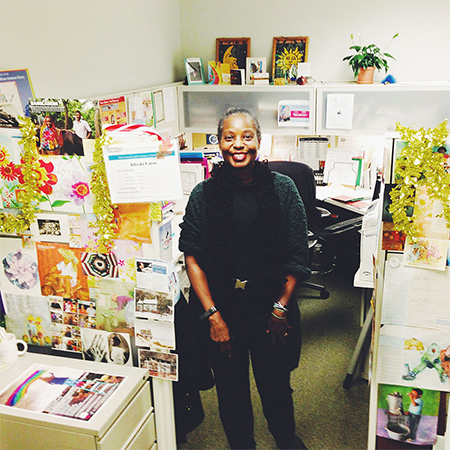 The jubilant holiday décor at Alfreda’s workspace has transformed a sterile cubicle into an intimate exhibition of diversity and inclusion that colleagues enjoy viewing for daily inspiration. Every detail is a reflection of Alfreda’s benevolent character. Her walls are covered with colorful prints of paintings, timeless photographs and uplifting messages from around the world. She states, “diversity encompasses the richness of differences; understanding that diversity continues to unfold as we learn and grow in our efforts for a more inclusive community and culture." Alfreda continues to envision the future of Diversity and Inclusion at NIH.